Planning On Doing An Escape Room? Here Are Some Tips! Doing an escape room can be just “some fun activity”… or it can be a test of your true competitive self, if we’re being honest. Because many formats of escape rooms exist, there are several approaches to getting out. Here are some general tips we’ve come up with to help beginners to intermediate (and hopefully experienced!) players overcome any kind of challenge and beat their escape room! An escape room is all about “teamwork”, therefore, this first point is extremely important. It’s easier to work with people you know or are familiar with rather than with strangers. With strangers, you’ll have the awkward first few minutes trying to get to know each other and understand how to work together. Sometimes it works and sometimes it doesn’t. But, an escape room can be filled with lots of emotions and stress (guilty…) that it’s easier to communicate with those that you’re comfortable with to ensure a positive experience. When the clock starts, that’s when you disperse and search every nook and cranny imaginable. Some puzzles are integrated within one another so, it’s good to be aware of what your situation is. There are rooms that are non-linear meaning there are multiple puzzles that aren’t in any chronological order. If your team is only working on one puzzle together, you run the risk of running out of time and being unprepared for the next challenge. In short, you’re planning, surveying, and solving all at the same time. It’s extremely important to designate a central area where you place anything important such as clues, keys, locks, lockboxes, flashlights, etc. This is to help all your team members be on the same page. Someone may need an item that you found in another area of the room so, it’s easier to communicate that information if they can just see it. You can solve riddles and figure out puzzles together. Also, rarely will keys be used twice so, it’s good to know which ones have already been used by leaving them in their appropriate locks. When you’re stumped, you’re stumped. Don’t be afraid to ask for a hint. Some rooms allow unlimited hints, and some only allow 1-3. In any case, use a hint when it’s extremely necessary and when your team has already spent more than 3-5 minutes trying to figure out next steps. An escape room “can” (and we say that lightly) be fun while intoxicated. However, if you want to win, being intoxicated makes it extremely difficult. You’ll need full concentration and awareness! Also, you’ll be able to actually follow the safety and rule spiels escape rooms give in the beginning. This is a big one. There have been instances where I’m so into an escape room that I think of wildly inventive and impractical solutions. Sure, it’s fun to get creative but, it’s always good to pull myself back and realize I’m overthinking. If you’re stuck on a puzzle, sometimes it helps to reset your mind on the puzzle you’re working on and think of it in a broader sense. All in all, an escape room is really about having fun. An escape room really is a one-of-a-kind experience that you could make the most of with your friends, family, and loved ones! We can’t guarantee that these tips will help you overcome every single room you decide to try in the future. 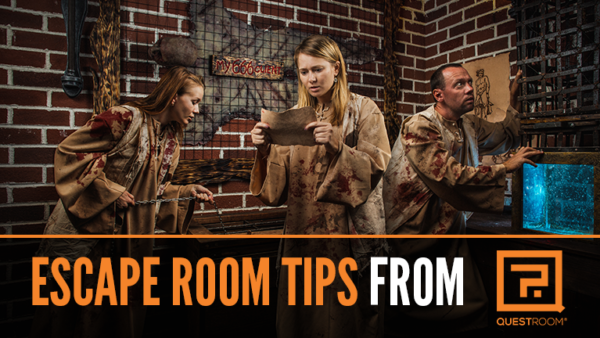 But, we do know that these tips will give you that competitive edge and enhance your escape room experiences to come! Happy escaping!